Jeep India has started building and exporting the Trailhawk version of the Compass. The company is now exporting the Compass Trailhawk to right-hand drive markets like Japan and Australia. The company has sent 600 units of the Compass to these markets, including the Trailhawk version. The Trailhawk is a off-road oriented version of the Compass SUV, with improved features for off roading. The vehicle gets a four wheel drive system with 5 settings – Auto, Snow, Sand, Mud and Rock. Hill Descent control, and also a low range (torque multiplying) option. The approach, breakover and departure angles are also improved, at 30 degrees, 24.4 degrees and 33.6 degrees respectively. The suspension has also been raised by 20 mm. Other changes on the Trailhawk version include revised bumpers, exposed tow hooks, skid plates for underbody protection and all-weather floor mats. The engine on the Trailhawk version is the 2 liter Fiat Multijet diesel with 170 Bhp and 350 Nm. Transmission is not a six speed manual though. Instead, Jeep offers a 9 speed automatic gearbox on this off road oriented version. A petrol engine is not available with the Trailhawk version for right-hand drive markets. Jeep does not offer the Trailhawk version in the Indian market. The company sells the Compass in India with 2 engine options, and two transmission options. The petrol engine displaces 1.4 liters, producing 160 Bhp-250 Nm. This engine gets 6 speed manual and 7 speed dual clutch automatic transmissions. The diesel engine is the 2 liter Fiat Multijet unit with 6 speed manual gearbox. The top-end Limited variant gets a 4X4 option. An automatic gearbox will be added to the diesel Compass next year. The Compass is the lowest priced SUV that Jeep sells in India. Prices start from Rs. 15.18 lakhs. The vehicle is built here with 65 % of localization. 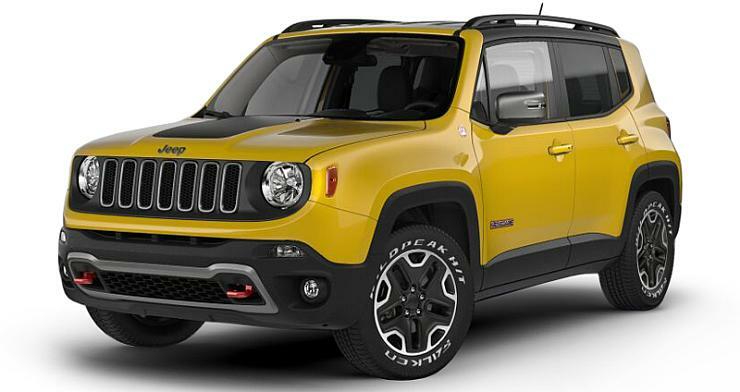 A cheaper SUV – the Renegade – will be launched next year. It will be shortened to under 4 meters, and positioned as a Maruti Vitara Brezza and Ford EcoSport competitor.